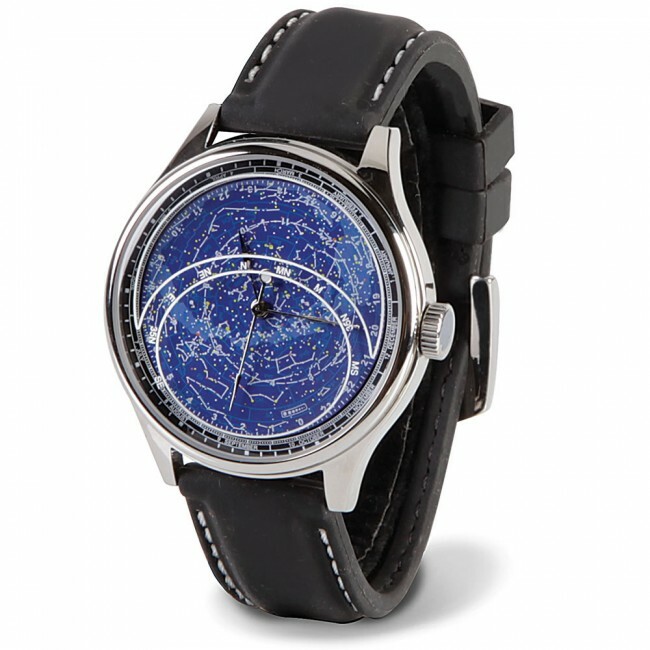 This watch contains all the major constellations that can be seen in the northern hemisphere. The watch part is quartz which allows it to keep relatively accurate time. Rather than me go over all the details (which I honestly don’t really understand), I’ll just quote from the sales page at Hammacher. Every 24 hours, the constellation disc revolves to indicate the altitude and azimuth of 1,056 fixed stars (with a brightness of at least 4.8 magnitude) and 169 major nebulae and star clusters at that date and time. The watch also tracks the sun’s path along the ecliptic on the 1st, 11th and 21st of the month and shows the local sidereal time, the hours for astronomical twilight and the pole star angle, providing essential data for stellar studies. The watch costs $189.95 and is available for shipping now.